Feedback can be uncomfortable to give, but with the right technique it can go more smoothly. Avoid these 10 common blunders when giving feedback to others, taken from the Center for Creative Leadership’s guidebook Feedback That Works. Mistake #1: The feedback judges individuals, not actions Putting feedback in judgmental terms puts people on the defensive. And you’ve sent the message that you know what is right or wrong. Mistake #2: The feedback is too vague. Steer clear of generalized, cliche’ catch phrases. If you want to really encourage someone to repeat productive behavior, you have to let them know what they did so they can keep doing it. Leadership BS? Whoa!! Got my attention. Excellent interview this morning on KSKA - "Here and Now", featuring Stanford Professor Jeffrey Pfeffer. How important is it for a leader to be inspirational? More important that facts, evidence, or ideas? ......"If you are a leader seeking to actually change a workplace’s conditions so as to improve employee engagement, satisfaction, or productivity, or if you are an individual seeking to chart a course to a more successful career, inspiration is not what you need. What you need are facts, evidence, and ideas. Cheering may be helpful at sporting events, but not so much in the nitty-gritty job of fixing workplaces and careers. This chapter lays out the many reasons why inspiration is not only a poor basis from which to attempt serious organizational change but also useless for figuring out how to have more personal success inside work organizations." Once again, NPR and KSKA delivers!!! Thank you!!! Staying busy is a virtue, a positive one, in my view. 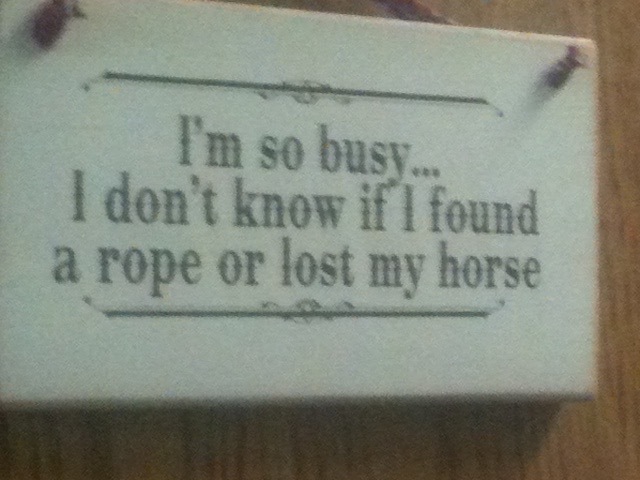 However, being too busy to distinguish between a found rope or a lost horse suggests to me that one needs to SLOW DOWN. Crossroads Leadership Institute (CLI) continue to expand into the Lower 48 with the opening of an office in Albuquerque, NM. CLI has been offering organizational consulting, facilitation, and conflict resolution services since 1989. We hope you will peruse our new website for an overview of who we are, and what we offer. Please call or email with any questions or inquiries on how we may be of support to you and your organization, or community.